Back in 2012 for the Hill County Centennial, I organized several tea and dinner parties to commemorate the event as well as other events reaching a milestone anniversary. One party I organized was for the 150th anniversary of the Homestead Act. I chose lime and yellow gingham dinner plates purchased at Herberger’s for the setting along with contrasting salad plates in Fiesta Shamrock (Herberger’s) and P86 Yellow (found at the Bon Marche in Great Falls, Montana, now out of business there), as well as tea cups and saucers. The chargers were woven rattan found at Pier 1 Imports. Bread and butter plates were antique lustreware I picked up at a thrift store, white with a pretty yellow and black trim. For water glasses, I used some tumblers I found at Herberger’s that I like to call “confetti” tumblers. Simple wine glasses by Arcoroc found at K-mart years ago are in their proper place. The flatware is Bradford by Cambridge Silversmiths, also found at Herberger’s. Steak knives are by Chicago Cutlery. Place cards are in the cutest glass chicken and egg holders I found at Pier 1 Imports. For the centerpiece, I used a lime green corduroy-type fabric runner down the center of the table found at a thrift store. 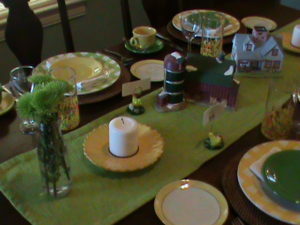 A ceramic farmhouse, barn and matching silo (also found at a thrift store) rest on the lime green runner, along with two sunflower salad plates found at Pier 1 Imports which serve as candleholders. Flanking the ends of the centerpiece are two empty old milk-jug containers from Starbuck’s iced coffees serving new duties as vases filled with little lime green chrysanthemums. Please excuse the quality of the photograph-I didn’t have a digital camera back then and used the camera option on my camcorder-not the greatest!